On June 10, 2005, a flash flood swept through a school in the town Shalan, Heilongjiang province, China and about 100 school children died. This story is about a tale of three media reports on the same event. These cannot be taken to represent the distribution, but they serve to illustrate three different styles of reporting. The representative from the western media is Los Angeles Times' Ching-ching Ni. This report appeared on June 14, several days afterwards. Generally speaking, the western media reports in the first instance were sparse due to the lack of information, and it takes some time to ferret out the information. In this case, there does not appear to be any government restrictions on media coverage. (Los Angeles Times) Parents Mourn Loss of Children in Flash Flood. By Ching-ching Ni. June 14, 2005. It was about 2 in the afternoon when Sun Shixiang and his wife saw the river water suddenly rise and rush toward the elementary school. Sun dashed over and found his only son trapped in his third-grade classroom. The water reached the farmer's waist and was still rising. For the next three hours, father and son clung to a window frame and waited for the deluge to recede. By the time they got out, more than half the school's 352 children had drowned, said villagers in Shalan, in northeastern China's Heilongjiang province. "When we forced our way in, there were little bodies floating everywhere. It was unwatchable," Sun's wife, Sun Xiuqin, said by phone from her home. Although her 10-year-old son was saved, her 8-year-old nephew and 9-year-old niece were not. "The parents went mad. Everyone was crying." Chinese authorities have attributed Friday's tragedy to torrential rains that caused the area's worst flash flood and mudslide in 200 years. They put the death toll at 92, of which 88 were children. But parents say the numbers are at least twice that. At the local morgue, most of the 100 refrigerators contained not one but two bodies, villagers said. Other children were missing or had been buried by parents. "We think at least 200 children died," said Ning Xuebin, 32, whose niece drowned in her classroom. "They are saying it's fewer than that because they don't want the truth to get out." In China, deadly floods are an annual plague. This year's rainy season, which began in May, claimed more than 200 lives in southern China and affected millions before the school tragedy. Now, citizens in Shalan and elsewhere are questioning whether the government has taken adequate precautions. According to an editorial in the China Daily newspaper, more than 30,000 reservoirs built in the 1950s and 1970s are in poor condition, verging on dangerous. Antiquated warning systems relying on bonfires or gunshots desperately need upgrading. The parents in Shalan say that nature is only part of the problem. "This is not just a natural disaster, this is also a man-made disaster," Ning said. "All it takes is a few minutes to evacuate the school, and all the children would be alive today." Parents interviewed by phone said that about 40 minutes before the water hit the school, someone in a village upriver had tried to call and warn Shalan of the impending flood. But no one answered the phone at the school. The person who picked up at the town office said he was too busy to do anything about it. Another call went to the local police station. The officers were out on duty. "The teacher, the principal, everybody has a cellphone. They could have easily warned the children," said a 36-year-old woman who gave only her surname, Zeng. Her 11-year-old son survived by running out of the classroom and wading in the river until his parents came. Three of their neighbors' sons didn't make it. "Why didn't they do anything?" she asked. "Are these people human?" By the time help arrived, most of the parents had fished their children out of the blackened water. Angry villagers said local officials had not only failed to lend a hand, they had stood in the way. As parents raced to the school on motorbikes, police officers stopped some to issue fines for permit violations. "If they didn't block the motorbikes, more parents could have gotten to the school on time to help the teachers save the children," Zeng said. When the police chief came, he just stood there and watched, said Zeng's father-in-law, who gave only his surname, Zhang. "He wore a life jacket," Zhang said. "One parent asked if he could borrow it. He said no. The parent jumped into the water without it." According to the official New China News Agency, the town's Communist Party and police chiefs are under investigation for allegedly failing to organize a timely rescue. What really shocked parents was that while some teachers risked their lives to help their students, others climbed to higher ground and abandoned the young. "There is only one little girl left in the first grade," said Sun Xiuqin, the mother of the 10-year-old boy who survived. "When we got there, we saw their teachers standing on the roof. Those were 7- and 8-year-olds. How could they have fended for themselves?" In some ways, the parents had known this was a disaster waiting to happen. The school sits on low ground. When the campus was reconstructed several years ago, it was supposed to be a two-story structure, but only one floor was built. Villagers believe officials pocketed the rest of the money. When the local reservoir overflowed, the water rushed down the river toward the school. It filled up like a tank. The original playground might have been large enough to hold the excess water, but it had shrunk after teachers built new homes on the plot. They stood like a wall and helped trap the floodwater. "It's like the school sat at the bottom of a wok. There's no way for the water to get out," Sun said. "The parents are devastated. Most of us have only one child. The police, government officials, if they cared enough, so many children wouldn't have to die." The next two media reports are translated from Chinese newspapers, and have been listed by the Chinese blogger Anti. The preceding LAT article has given you a sense of what happened (and it may or may not be the complete picture), and so you can now take a look at what is said. The first report appeared in Heilongjiang's local Life News and written by three reporters. Anti explicitly characterizes this report as an "extremely shameless and anti-human crime." On the second day of the Ning'an City Shalan Town flash flood disaster up to our reporting deadline of 11pm on June 11, there have been 64 deaths. The provincial party secretary Song Fatang and provincial governor Zhang Zuoji have arrived at the scene to direct the aid work, and aid/clean-up work is progressing urgently, systematically and effectively. According to a hydrological expert with the provincial water works department, the sudden rainstorm on the afternoon of June 10 was fast and furious. Shalan Town received an average of 120 mm upstream, and the flood arrived at a rate of 850 cubic meters per second for a total of 900,000 cubic meters. This was a once-in-200-years event. Such a small-scale, small-area weather event cannot be predicted with the current technology and scientific knowledge. After learning about the disaster, the provincial party secretary Song Fatang, the deputy secretary and the deputy governor hurried to the front line and directed the aid work at the scene. They went to the Nang'an City Number Two People's Hospital to comfort the injured citizens on behalf of the provincial party committee and the provincial government. Song Fatang told the medical staff to use the best medicine and the best equipment to provide the best care. Song Fatang emphasized that the most important task is to locate the survivors and the missing, to care for the injured and to handle the post-disaster relief and comfort. On the morning of June 11, the reporter went to Shalan town. According to the teachers, students and eyewitnesses, the flood rushed right into the classrooms. Many of the teachers at the school ignored their own personal safety and broke the classroom windows in order to carry the children out one by one. In the first class of fourth grade, 21 out of 29 were successfully rescued by the teacher Sha Xianjing. At 5pm, the reporter visited the Central Primary School in Shalan Town, and saw that the indoor cleaning has been completed; the desks and chairs are arranged neatly, and the militia who came from Mudanjiang overnight were busily cleaning up the place. After the disaster occurred, Mudanjiang City and Ning'an City both deployed their local aid, health, education, civil administration and public security departments to set up work groups to handle rescue, medical assistance and post-disaster relief. Within a short time, the local civil administration sent tents, food and mineral water to the disaster scene. The hospitals in Ning'an also sent many rescue teams to render aid at the scene, as well as sending medicine to the people. In order to prevent the spread of epidemics, the provincial and local health departments are conducting cleaning and decontamination. The provincial diseases control center will clean the water sources of the village as quickly as possible in order to insure that water supply is restored. On the afternoon of June 11, provincial party deputy secretary and governor Zhang Zuoji arrived at the disaster area, and met with provincial party deputy secretary and general secretary Liu Dongfei and deputy provincial governor Xin Liguo to organize disaster relief at the scene. Zhang Zuoji gave approval to the disaster relief work. He said that with the concern of the Party Central and the State Council, the disaster relief work was timely, orderly and effective. All the provincial departments appeared on time, worked actively and participated directly; the local military and militia held the most difficult, most dangerous and most laborious positions; the Mudanjiang City party committee and government and the Ning'an City party committee and government acted responsibly and effectively in their direction of the disaster relief. Concerning the current disaster relief work, Zhang Zuoji has stated some clear requirements. First, to locate all the missing people with every possible effort. The resources will be organized for a thorough sweep to locate all deceased, injured and missing people. Those who are injured, ill or hospitalized will be given medical care so that they can recover and return to their schools or jobs; during the disaster relief and reconstruction, the affected masses will be guaranteed food, shelter and security; public infrastructure will be restored as quickly as possible, insuring that the mud is cleared out and preventative measures are taken against epidemic outbreaks; the school must re-open by June 13; effort must be made to prevent a recurrence; insure stability among the affected masses; communicate any touching stories about the rescue work to the outside quickly in order to lift spirits and restore confidence. Concerning the entire provincial disaster alert system, Zhang Zuoji wanted a perfect emergency system in place, and for people to overcome thought paralysis and to increase alertness. At Ning'an Number Two People's Hospital, provincial governor Zhang Zuoji and party general secretary Liu Dongfei visited students, teachers and villagers who injured by the floor. Zhang Zuoji inquired in detail about their injuries and current statuses, and he also thanked the medical staff for their efforts on behalf of the provincial party committee and government. According to information, this hospital has received 30 patients; after more than 20 hours of continuous medical labor, all the patients are now out of danger. 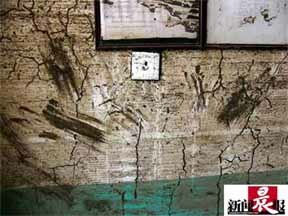 A photograph on the front page of the Beijing News showed the muddy hand prints slipping below the water line on a classroom wall in the sprawling, one-story building. But the western media cannot show you those handprints. For that, you have to go to the Chinese media. "Any reader who saw the news photos captioned 'The final handprints left by the deceased students in the Heilongjiang flash flood' must have been stunned. I feel that there is no doubt that the photo taken by Beijing News' Li Yan (李艳) (note: for the record, the attribution is incorrect; the photographer was Guo Xianghe (郭翔鶴)) must qualify for the best news photograph this year in any competition within China, and it is worthy of entry into the World Press Competition. And the report by Shanghai Morning Post's special correspondent Guo Xianghe (郭翔鶴) is on par with any Pulitzer award winner." 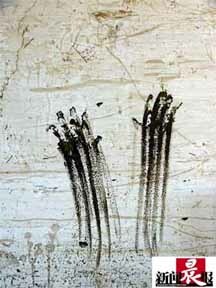 (Shanghai Morning Post) The young ones left their final marks on the wall. By Guo Xianghe. June 14, 2005. [in translation] "As I wrote about this incident, my pulse is still jumping; even if I should live until I am 10,000 years old, these sights will still be right in front of me." 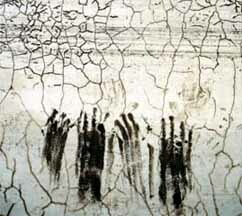 At 13:15 on June 13, 2004, when I saw the row of shocking handprints on the wall in Shalan Town, Ning'an City, Heilongjiang province, I fully understand the meaning of this famous saying of Rousseau. Seventy-two hours ago, a flash flood sent water into the classroom of the Central Primary School of Shalan Town in which I am standing. Dozens of children struggled in the flood water that rose higher than their heads. A few students were carried against the wall, and they helplessly moved their hands about in vain to get out of the muddy water that was coming into their lungs. Most of the students did not make it. Three days after the flash flood, in the damaged one-story building that was the school, a northerneastern People's Liberation Army soldier who took part in the rescue work told me that there were handprints left near the windows by the children who struggled in the water. I was shocked, and I went through the corridors that were still covered with mud and I searched the classrooms for the signs that indicated the struggle for life. 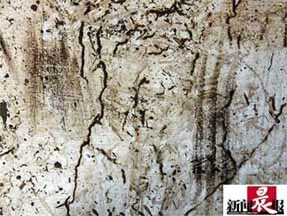 After the flood receded, the previously white walls were left with brown, misty watermarks. 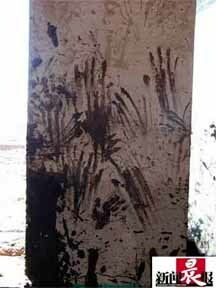 But where the hands ran over the wall, there are reddish brown mud prints. These were handprints! There were small and large hands. They belong to the students in first grade and the parents and villagers who came to save them. If an unknowing artist came and saw them, he might have thought these were just marks left by wild geese, or marks left by flaming fires or he might have treated this as the work of some artist -- yet, the ironclad fact is that these handprints were left behind by people involved in a deadly tragedy not so long ago. While these handprints still hurt our senses sharply, and while the memory of the 2005 Heilongjiang flash flood has not yet receded, it would be most valuable for us to think about what we can do for the dead children. And how can we prevent such a tragedy from occurring again? In flood-devastated Shalan Town, an anonymous Beijing expert gave the reporter this assessment: "The flash flood at Shalan Town is a disaster that typically happens once a century and cannot be turned back by human effort. Some villagers even think that the tragedy at the school will cause the responsible school principal to become the 'most unfortunate man in China' of recent days. But the construction planning for schools should stimulate us to think about the haphazard planning of schools in towns and villages. The steady economic development has caused residences and public infrastructures to grow like wild grass. Using Shalan Town as an example, the school was situated at the lowest point of the area. Outside the wall is a small river that may swell rapidly in summer rainstorms. When the school was renovated in 2003, no one considered that the foundation ought to be raised in order to prevent the rain water from entering the school. The disastrous Shalan Town incident may cause China to have better planned and safer small towns and villages in the future."